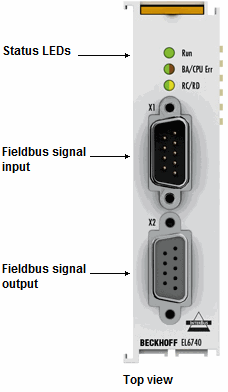 The Interbus slave terminal facilitates data exchange between EtherCAT and Interbus. For both bus systems the terminal “mirrors” up to 32 word input and 32 word output to the respective other system. The outputs are written to the inputs of the other bus with minimum delay. The terminal can use the Interbus protocol up to a baud rate of 2 Mbits. Due to the connection via EtherCAT, no PCI slots are required in the PC.